Who has SA racing expert Aaron Barby got to win the Goodwood this Saturday? 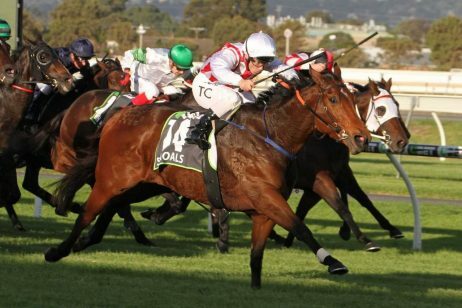 South Australian expert Aaron Barby gives his racing tips for the Group 1 Darley Goodwood on Saturday at Morphettville. Arguably the best sprinter in Australia when on top of its game – ran second to Redzel in the Everest and was really the better run. Looked alright in the trial at Tatura. The wide draw is a bit of a concern but I think it’ll slot in. Deserved favourite. Get back, run-on type so will need luck in running. Had mucus post-race first-up at Caulfield and then was held up at Morphettville before hitting the line really strongly. Was a fast pace though, so was entitled to hit the line hard. But it was strong and looks in form. Can be in the finish with a bit of luck. Couple of months since last start. Has won races off a break before and goes forward and makes his own luck. Drawn well and proven at this grade. One of the major players here. A few negatives on it. Last start was second in a Group 1 (Sangster), but they went quick so she was entitled to run on, and just grabbed second in a bunched finish. Two starts back had the perfect run and couldn’t convert. Just looks fully exposed and I think we’ve seen everything it has. Drawn poorly. Another get back, run-on type. Has had a setback. Not for me. Really good first-up record, and the stable of course has to be respected. Will need some luck to get clear from barrier 1, but will be competitive. Will strip fitter from his last run, which he probably needed. Led at an above-average pace and just fell short. I would’ve liked to have seen a little bit more but can improve – maybe just not quite enough for this. Complete forget run last start where it never got clear in the straight. Everybody saw that though, so you won’t get much advantage there betting-wise. I don’t think it runs out a strong 1200m. Gets Jamie Kah, which is a big positive, but I think there’s a few here that will be a bit stronger late. Think it has inferior form lines to some others here. Got beaten a nose by It’s Been A Battle here a few starts back but this is a decent step up. Awkward draw too. Was pretty good last start in a high-rating race. Gate 20 here however, so is going to be up against it. Had the run of the race in winning last start. Really respect the stable but think he’s probably just behind a few of the top liners here. Probably a place chance. Like the horse but has been disappointing this prep. Just not going that well this time in. Wide throughout last start and didn’t finish far behind horses like Viddora and Secret Agenda. Has drawn well and is usually pretty competitive in these high-pressure handicaps. Also meets Viddora and Secret Agenda 4kgs better at the weights. Reckon he’ll run a race, has a chance. Another one who’s up in grade. He’s in form but this is a lot harder. Happy to risk. Lightly-raced, blinkers go on. Big step-up here and just doesn’t have the credentials at this grade. Stepping up from a Benchmark 90 to a Group 1. Not for me. Suited by fast tempo last start. This is harder and another I’m not keen on here. Really don’t mind this one. Can really run a race and challenge the top hopes I think. Ran in this last year where she was three-wide no cover against the likes of Vega Magic and actually showed a better turn-of-foot. Drawn well and has race fitness under her belt – last run was her first time out in a couple of months and she’ll strip fitter. Career-high rating last start but was flattered by the speed. Others have more appeal. Not up to this grade. I’m obviously respecting the quality of the likes of Vega Magic and Thornum, particularly the former who will be tough to beat. The value is probably with Flamberge and Missrock.